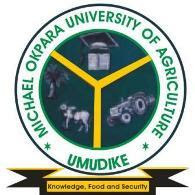 This is to inform all the candidates that participated in the Michael Okpara University of Agriculture (MOUAU) admission screening exercise that their results are now available online. Steps to Check MOUAU Post UTME Screening Result. Go to MOUAU post UTME screening result checking portal @ http://mouauportal.edu.ng/putme/screening-result.php. Enter your registration number in the required column. Finally, click on search button to access your MOUAU post UTME result. Note: The MOUAU Admission Screening portal will verify your O/level results by either WAEC, NECO or NABTEB. Ensure you have valid O/ Level result verification card before you continue. Invalid O/level results verification may lead to your disqualification. If you are using two results, you need two cards to verifiy your results on the Portal. For further clarification, email: support@mouau.edu.ng or visit the Portal office.